Did I Catch A Rabbit Today? I had not. But I do think the mere presence of the rabbit trap has kept Mr. Rabbit and his family away today. I can just imagine him telling the missus and their bunny babies, "We need to stay away from Carol's gardens for a while because she saw me yesterday and wasn't too happy about me eating the beans. Now she's set that trap and it is just too dangerous for us right now. 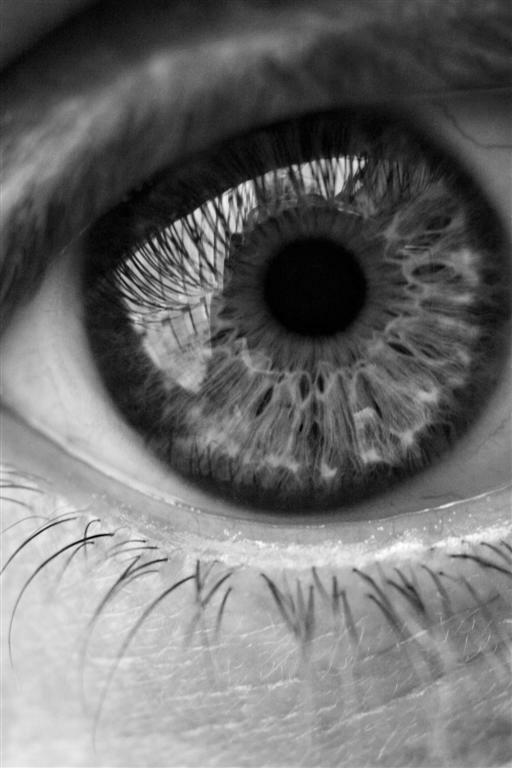 Wait until she gets distracted by something else, and then we can go back." There's quite a bit to distract me in the garden right now, starting with the grapes. I am going to have a lot of grapes this year. I should probably start lining up people to give these to since I don't cook much or make jelly or preserves. I just hope the Japanese Beetles, who generally find these grape vines right away when they emerge in late June, were killed off by the April winter weather or find it too hot to eat this summer. Then there's the corn. We were taught growing up that corn should be "knee high by the fourth of July". My corn is knee high now, so I wonder how tall it will be on the fourth of July? 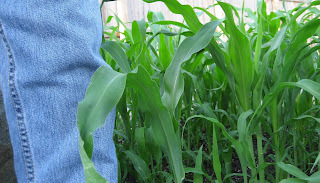 My other corn crop at my second garden needs water according to my sister, so I don't think it is knee high yet. I'll have to check into that this weekend. I won't be doing much more watering of the lawn for awhile. This morning the water company asked people to water on the odd-even system. If your house number is an even number, then water on even-numbered days. Then this evening, the water company annouced through the media for everyone to voluntarily stop watering lawns until we get some rain. They say it isn't a capacity problem, there is plenty of water. It is a distribution problem, that we lack the infrastructure to get water to everyone with a high enough water pressure. That makes it dangerous if there is a house fire to be put out, if the water pressure is too low. So the neighbor down and across the street, with an odd numbered address is watering his lawn this evening, on an even numbered day, and on the first day when we aren't supposed to water lawns at all. They must be better than all of us, exempt from the rules that we "less neighbors" follow. I don't know them well enough to go down and tell them to "get with the program". I just hope the other neighbors with automatic sprinkler systems turn their systems off, and don't also consider themselves exempt from the ban on watering. In a few weeks, we'll know who is following the watering rules and who isn't! Personally, I like the ban, as it takes the pressure off (no pun intended) having a green lawn when it is so dry out. But enough about the water situation. 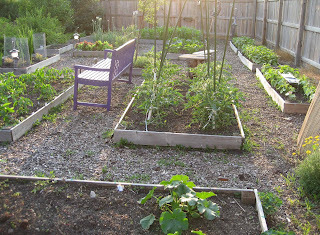 The vegetable garden is starting to look like a real garden and not just raised beds of dirt. And here's the view looking back to the west. Those three narrow beds along the right are the beans. You can see the rabbit trap in the first bed. Maybe tomorrow I'll catch me a rabbit. Maybe the neighbor just didn't get the message yet? That must be it! I think you need to get YE's recipe for wine or champagne! Looks like a bumper crop! If your grass is knee high by the 4th of July then mine couldn't possibly be here in cold New England. Where did that phrase originate? Anyway, your corn is looking good but mine is about big toe high! The garden looks great also. I love the two angled shots. Knee high by the fourth if july. I herd that when I was a kid. Your garden looks good. Maybe one day I will put weed fabric down and mulch in between the beds. Hope you catch the rabbit or he stays away. 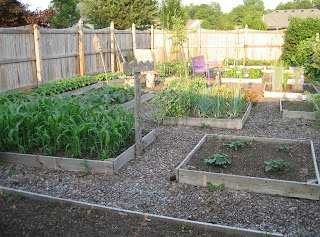 Your vegetable garden is looking very good! No wonder Peter Rabbit came calling. He'd probably like to sit in the shade under the purple bench too! Your corn and flowers are beautiful Carol! I hear on the radio and hear the farmers talk that crops are good this year on growth, but we need rain! We are always complaining aren't we? haha!! Hopefully you will catch that rascally rabbit! Every year, we have odd-even watering. Around here it is because there is so much sand in the water table that if the wells are drained to quickly we get nasty brown water (even with the new water-treatment system the city built a couple of years ago). They brought some new wells on line a couple days ago(back=up wells they only use in summer) and the water tea. In the past I've had loads of whites turn an icky off-white tan. That would be a long-winded way of saying I understand your frustration with your neighbor we have to deal with that sort of behavior too. However, the city has patrols out every day and the fines are getting steeper every year. Lovely and interesting post-lots going on. 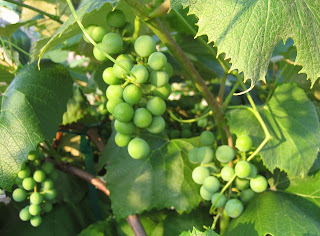 I like the grapes- we were one of the few people in the Caribbean with grape vines, when I was growing up. ( its still quite rare, here). Someone had gotten my father two scions form the mid-east. The veggie beds are looking great, too. Your grapes look beautiful! I'm assuming people with gardens can still water, just not the lawns, or is that prohibited too. Your garden is so beautiful right now I'd hate to see all of your hard work dry up. All... thanks for the comments. I saw the rabbit again this evening, eating leaves out of another bed of beans. So I moved the trap to that bed. Robin... yes, we can water plants, tree, shrubs, but not by sprinklers. Even this morning a neighbor had a sprinkler running and those with automatic sprinklers haven't figured out how to turn them off, it seems. Sorry you didn't get the rabbit yet, they are crafty! I have a woodchuck that likes to taste test. My painted daisy seems to be his favorite though as that was eaten to the ground. I'll keep checking back to see if the trap works.